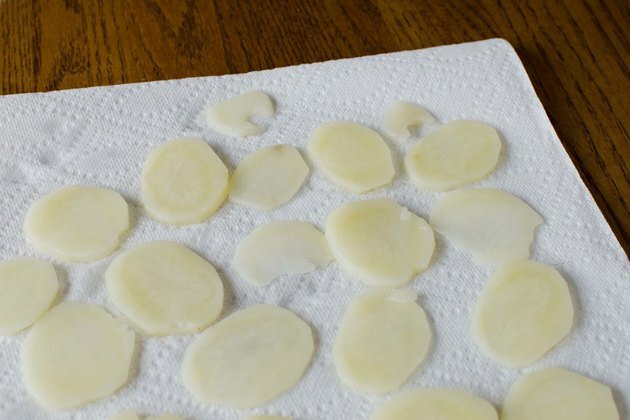 Use a dehydrator to make crispy potatoes similar in texture -- but healthier -- than salted-and-fried potato chips. Potatoes have as much or more potassium than bananas, broccoli or spinach. They are also a source of vitamin C, magnesium, iron and zinc. One potato contains about 110 calories, 2 grams of fiber and 3 grams of protein. Crispy, dehydrated potatoes have a dual purpose; eat them as a snack or rehydrate the potatoes to use in recipes calling for fresh potatoes. Cutting the potatoes thinly before drying them helps the potatoes to dry all the way through to ensure that they turn out crispy. Blanching the potatoes before you dry them speeds up the drying time and removes the starches that may prevent the potatoes from crisping. 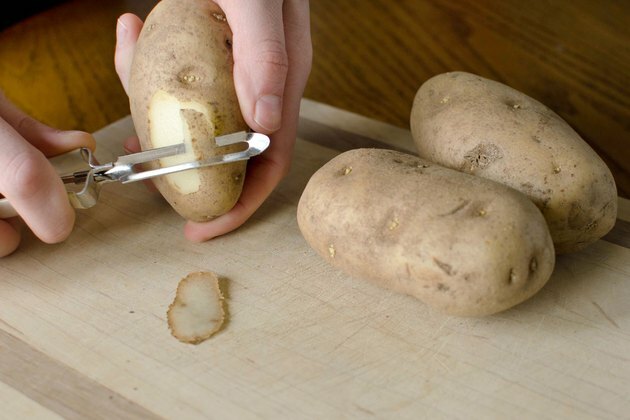 Peel the potatoes with a vegetable peeler. 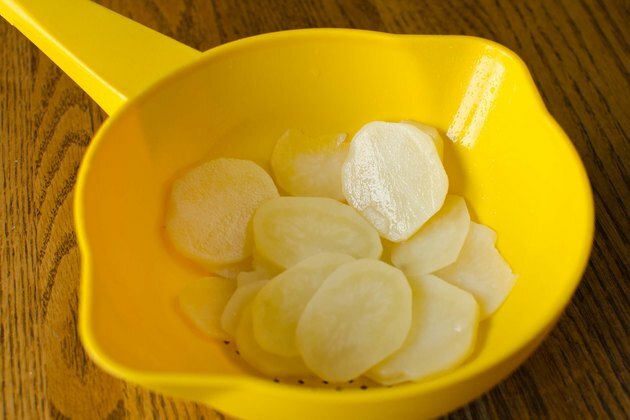 Slice the potatoes into about 3/8-inch-thick slices or shoestrings with a knife or mandolin. 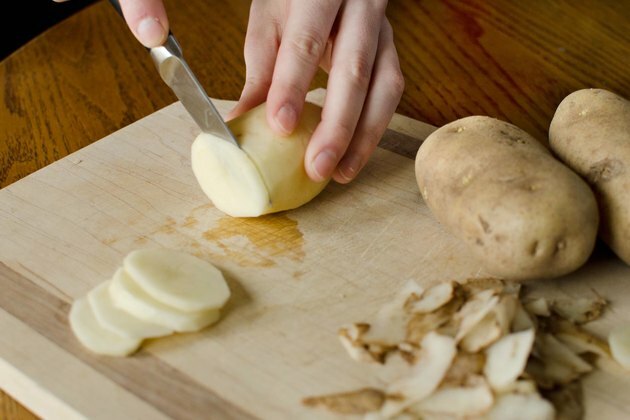 Or use a food processor fitted with a 1- or 2-millimeter slicing blade to slice the potatoes more quickly. 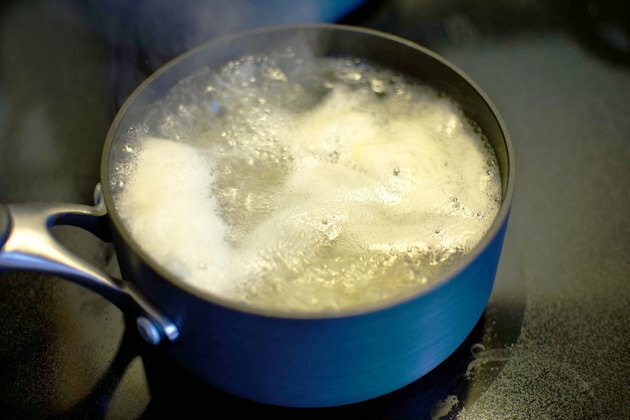 Blanch the potatoes in a pot of boiling water for two to three minutes, just until they are hot. 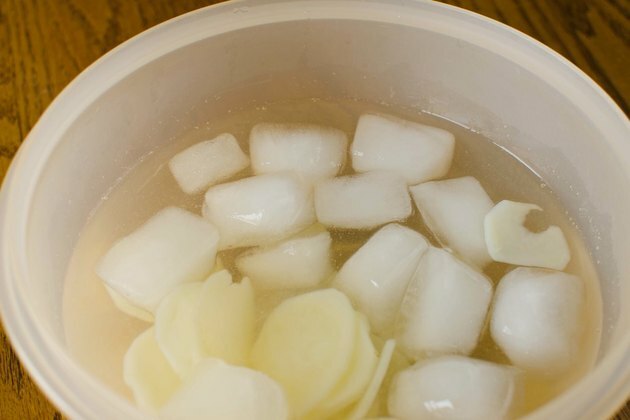 Transfer the potatoes to a bowl of ice water. Drain the water from the potatoes once they are cool. Dry off the potatoes with a kitchen towel or paper towels or let air dry. 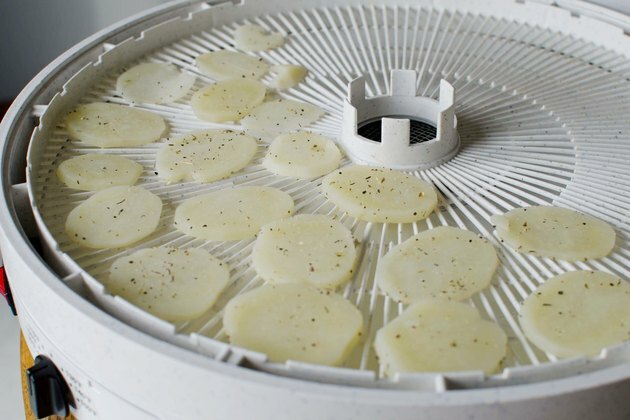 Place the potatoes in a single layer on the dehydrator trays. The potatoes should not overlap. 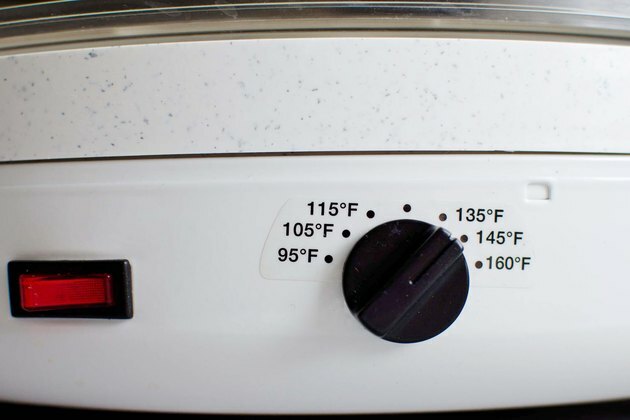 Set the drying temperature to between 130 and 145 Fahrenheit. 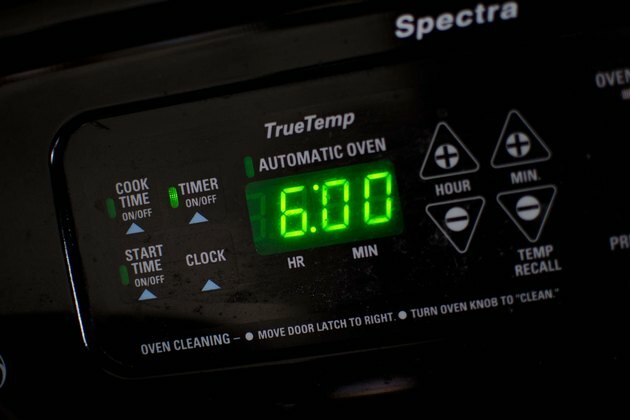 Dry the potatoes for between six and 12 hours, or until the potatoes are brittle with no pockets of moisture left. The potatoes should be crispy enough that they shatter if you hit them with a hammer. 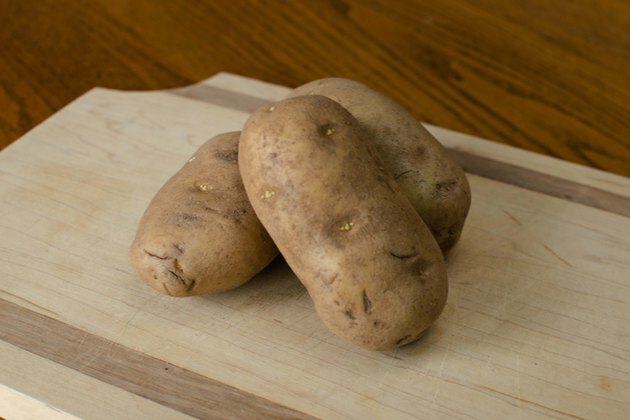 Package the potatoes immediately after they are done drying to prevent them from absorbing moisture from the air. Place the potatoes in a moisture-proof, airtight container that is dark colored so that light cannot penetrate it. Store the container in a cool, dark area.